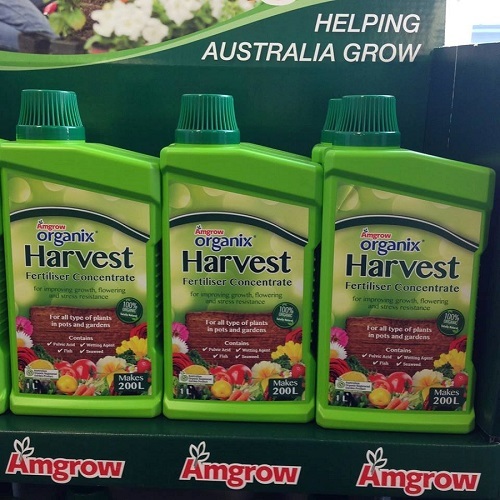 class="post-template-default single single-post postid-4928 single-format-standard wpb-js-composer js-comp-ver-3.6.12 vc_responsive"
The new look Amgrow Organix Harvest is now in stores. Take advantage of using a BFA 100% organically certified product. All natural, containing seaweed, ocean fish and fulvic acid for enhanced nutrient uptake. Amgrow Organix Harvest is fantastic, improving soil structure, and increasing microbial activity of the soil for improved nutrient availability and uptake by plant growth. It also improves plant growth and boosts flower and fruiting.